Can You Lighten Your Hair Without a Salon Trip? Perhaps so, with John Frieda Brilliant Brunette® Visibly Brighter™ products. It’s been quite a while since the last time I colored my hair. 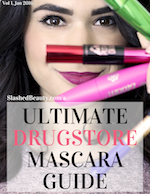 While I love switching up my shade, going to the salon is an unbearable hassle for me. Having thick hair is a pure curse when it comes to salon coloring. It takes triple the time, and sometimes even double the product… which usually translates to paying over their normal rate for the service… seriously, I’ve paid over $200 once. Yikes. On top of that, box color limits you to a certain amount of product as well, and it’s hard to get even application on myself. 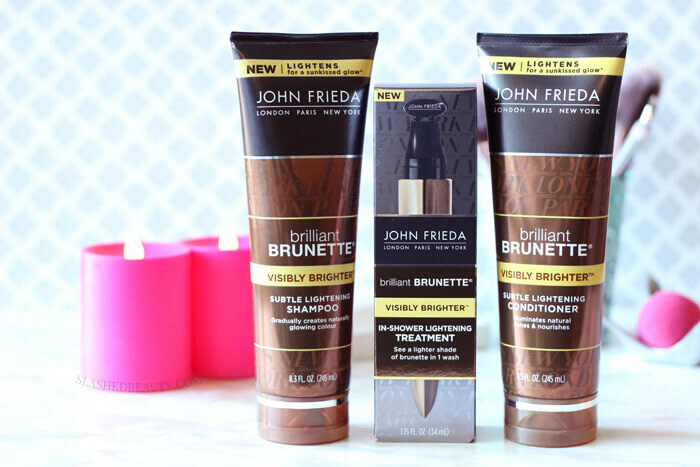 So I’m pretty excited about the new John Frieda Brilliant Brunette® Visibly Brighter™ Subtle Lightening Shampoo and Brilliant Brunette® Visibly Brighter™ Subtle Lightening Conditioner. 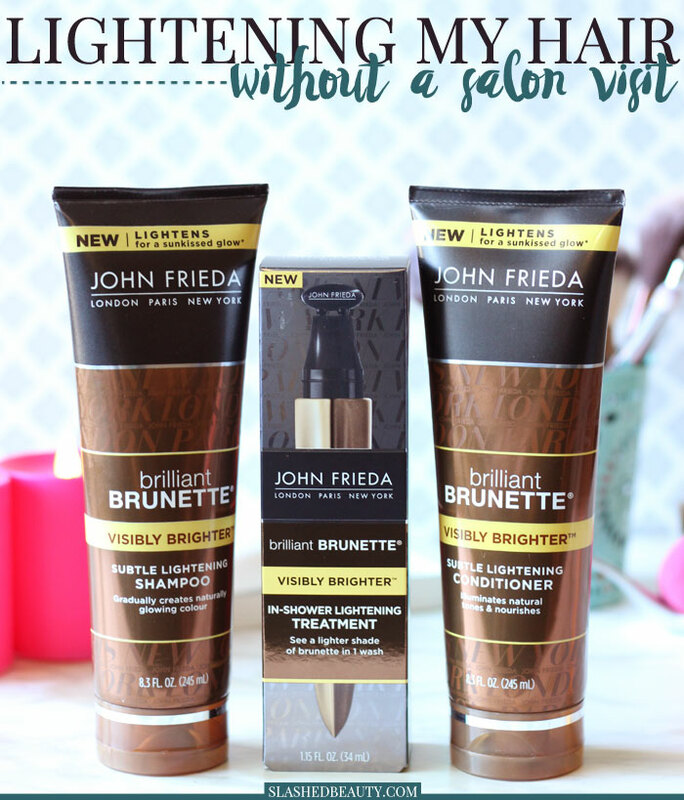 These new launches, along with the Brilliant Brunette® Visibly Brighter™ In-Shower Treatment, are designed to lighten your hair at home, without having to see a stylist or pay salon prices. I think the Visibly Brighter™ Shampoo and Conditioner will make it easier to give my hair a subtle lightening for spring without having to go through the hassle or cost of the salon. Since it literally takes as much time as washing my hair normally, it’s like I can kill two birds with one stone as it visibly boosts brightness daily. I like that the Visibly Brighter™ Treatment only lightens your natural spectrum, so I don’t have to worry about my hair looking brassy or orange-toned. I’ve definitely had that problem as a brunette when lightening my hair, and it’s never cute. It lightens up to one shade instantly, and I’m excited to see how it does on my dark hair, which has natural highlights to it. 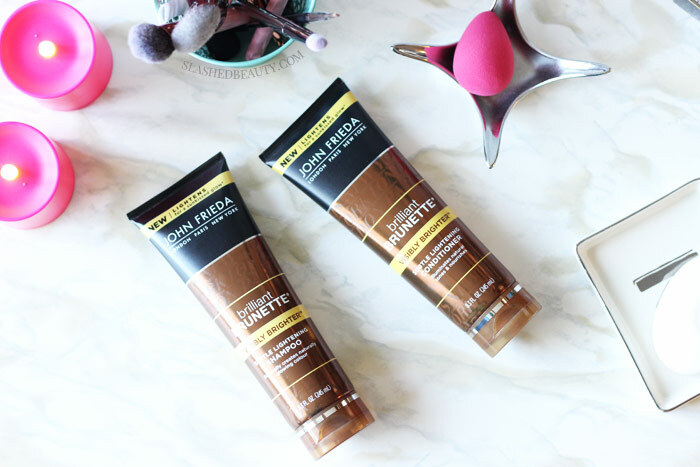 It’s supposed to instantly lighten for a sun-kissed brunette shade, which is exactly what I’m going for this spring! It’s also safe for natural, highlighted, and color-treated brunettes. I have natural highlights weaved throughout my hair, and I’m hoping that the Visibly Brighter Treatment™ will help bring them out in a healthy way. After seeing this video of how it’s supposed to work on brunette hair, I have high hopes! I’m going to start using all three products tonight, and I’ll update you in about two weeks, since that should be enough time to see some really clear results! 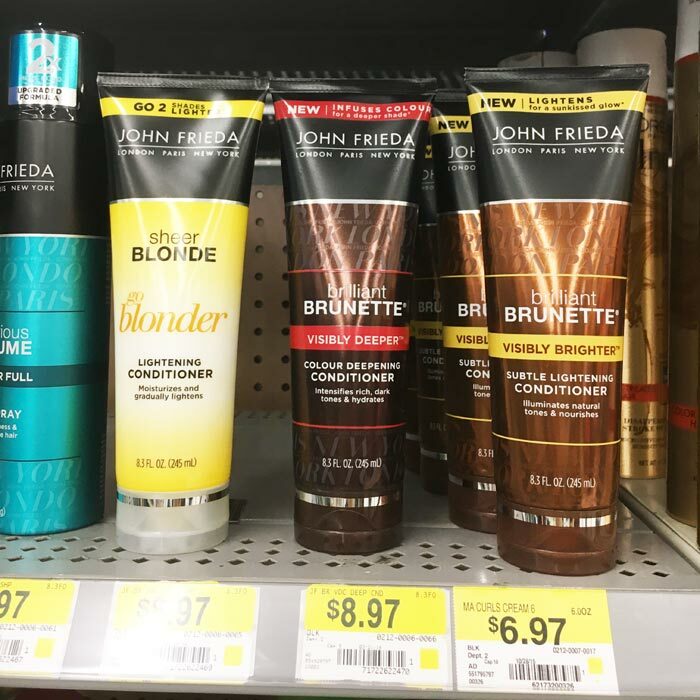 You can find the Brilliant Brunette® Visibly Brighter™ Products in the hair care aisle at your local Walmart, or online at Walmart.com. Since they’re so affordable and accessible, I’m hoping for beautiful results so I can continue saving money by taking salon visits out of my hair coloring equation. 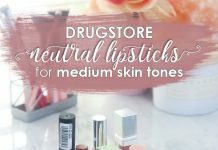 How much do you normally spend on a salon color? Can’t wait to see your results! My hair has been feeling so dark all winter, I’ve been wanting to get it colored or highlighted at a salon to help visually lighten it up, but I would love to do something like this instead! I used these and they really do brighten the hair. Love! Eeeeee! I’m so excited to see the results! I mean, I’ve already got horrible, brassy lightened grow out so this won’t apply much to me, but it’s still something really cool that I might be able to use in the future! I love the Brilliant Brunette line! Mostly because the smell is amazing, haha! I like the Blonde system to keep my hair bright and non brassy. Hope the brunette works for your highlights! I’m looking forward to seeing how this works for you! I’ve never done permanent color on my hair, and now that I’m going grey, I’m going to wait until I need to! But something like this I would do, if it works. 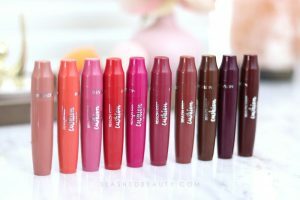 I like the Brunette line from this brand. This sounds nice! I’ve never tried this line before. 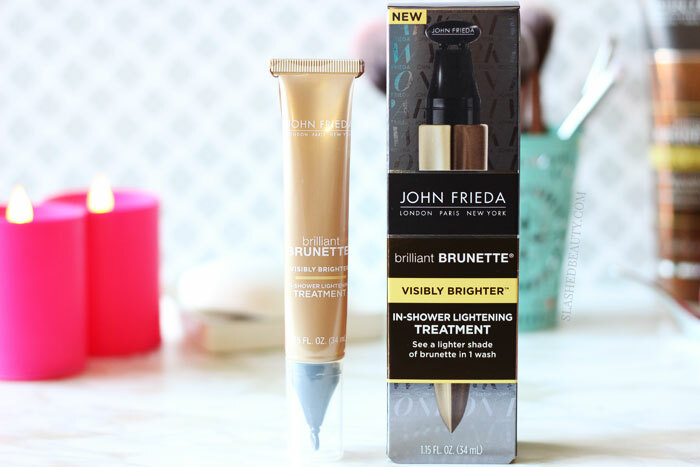 I’ve tried John Frieda products before and love them. I haven’t started to color my hair yet though so I’m not ready to start using this line yet. If I didn’t have so much gray I’d love this. John Freida is very innovative with their new lines. I’ve never had a salon colour, though I’ve experimented at home. This sounds like a nice choice for brunettes. I spend $125 plus tips a month, I think, on salon color, but it’s not a simple process.